Annual Staff Picnic: First Large-Scale Zero Waste Event! The Annual Staff Picnic was host to 2,500 UC San Diego staff members in Town Square on Friday, August 10. 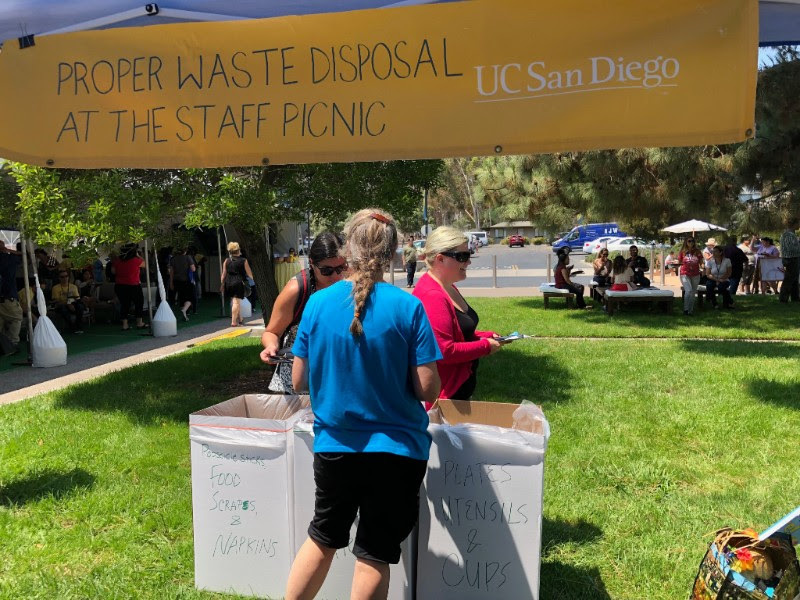 The Staff Sustainability Network (SSN) worked with Special Events and Facilities Management to make this the first large-scale zero waste event at UC San Diego. SSN recruited volunteers to serve as “Trash Talkers”, standing by waste stations to help staff members dispose of waste properly, handing out reusable sporks, staffing the SSN table, and directing staff to water refill stations. SSN designed and provided signage for the receptacles, helping staff to sort disposables into three categories: food scraps and napkins, dinnerware: plates, cups and utensils, and other. SSN collaborated with Rogers Community Garden (RCG) to pick up 46 pounds of food scraps and napkins to be composted in their anaerobic digester. 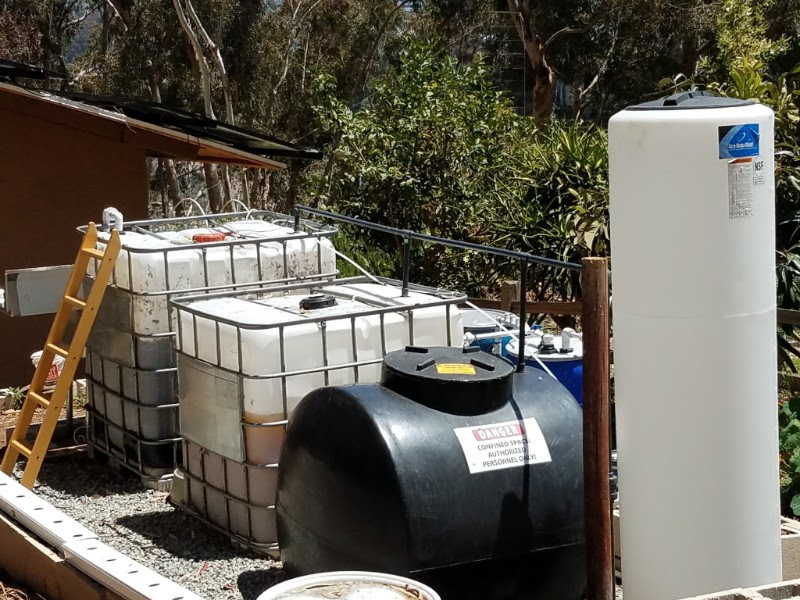 Enid Partika’s small-scale anaerobic digester project with Engineers for a Sustainable World (ESW) and the Carbon Neutrality Initiative (CNI) Fellowship Program is being used as a model for future consideration as an alternative source for campus-wide renewable energy. The digester converts food waste collected from Price Center into fertilizer to be used in community gardens and other areas. It also creates biogas, which is then pushed into an electric generator that is continuously providing renewable energy for the hydroponics at RCG. SSN also partnered to promote zero waste efforts with Resource Management & Planning Facilities Management – Building Services by replacing office garbage bins with a mini can. 50 lucky staff members left the SSN table at the Staff Picnic with their new Bin Buddy (pictured here) and a laminated recycling poster. If you didn’t already join the waitlist and would like to request a Bin Buddy, please contact Yvonne Haywood-Cole at (858)255-9482 or by email. Click here to learn more about the Bin Buddy Program @ UC San Diego. This year’s picnic theme was Fun Diego. 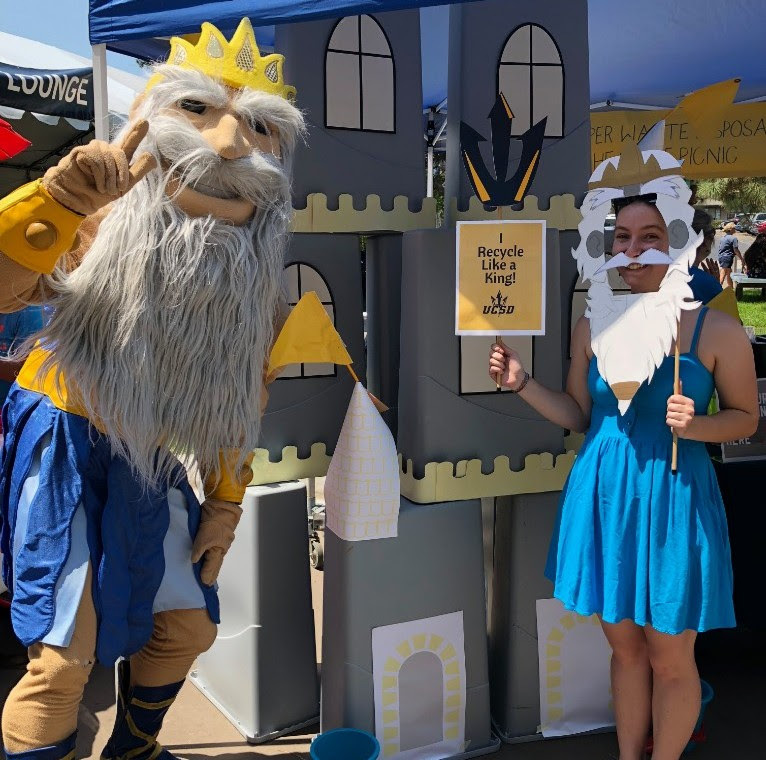 In that spirit, SSN used waste bins and repurposed poster paper to build a castle and King Triton mask. Thank you to University Centers Facilities Management staff for providing the waste bins and helping theSustainability Resource Center recover posters from Price Center weekly to be reused! The SSN table won the 2018 Staff Picnic Best Table Competition! Thank you to everyone who stopped at our table and posed for a photo as King Triton in front of the castle of waste bins. See more photos here. What about your research gets you most excited? We are an active ichthyology lab. Our research covers many aspects of fish biology from taxonomy, phylogenetics and systematics to behavior and biogeography. I think what most excites everyone in the lab and really drives our research is the sheer diversity of form and function in fishes. There are over 35,000 different species in all shapes and sizes and they have adapted for almost every aquatic habitat. We house over 2 million fish specimens and just being able to interact with this diversity on a daily basis is pretty magical. What’s one sustainable practice your lab has implemented, between the beginning of researching to now, that you feel has made a big difference to its environmental impact? The Marine Vertebrate Collection is in the business of long term preservation of material and resources. As such, we store specimens for the long term in 50% isopropyl alcohol. Over time pigments and oils can leach out of the specimens and discolor the alcohol. This is not great for when you are trying to see a specimen without removing it from a jar. So we tend to cycle and recycle usable preservative. We end up reusing this preservative in our large storage tanks as the alcohol still serves its function and cuts down on chemical waste generation. SIO and SIO 4 Sustainability piloted a composting program in June. The composting program was a success, so we deployed containers to additional kitchenettes. Volunteers help manage the bins. SIO Safety also hosted the first zero-waste Scripps Safety Day. We’re committed to providing a composting option to other SIO events. Please see attached for the initial 32G tote pilot with SIO 4 Sustainability members, and the smaller bin permanent program now in use. A recycling center was set up in my office in May, with the help of the UCS Sustainability Office. Items collected are small e-waste items, writing brigade instruments, batteries, water filters, plastic bags, and light bulbs. All universal waste is properly tagged and disposed of through EH&S. SIO 4 Sustainability hosted a Garage Swap where everyone was welcome to bring used/unwanted household items like clothing, books, and kitchen items and take other participant items for free. SIO 4 Sustainability distributed reusable kitchen items to SIO kitchenettes to replace disposable items. All leftover items were donated to Goodwill. 1648 pounds of e-waste was collected over the month. The SIO Director’s Office recently became Gold Certified. A recent development is that we’ve stopped purchasing reusable kitchen items, including plastic bags and forks, and removed our DI water drinking system. Not only have we saved money, but we’re encouraging sustainable habits! Imprints print and copy centers offer a number of options that reduce waste and support sustainability. At Imprints, we’re committed to preserving the planet. In support of UCSD sustainability initiatives, we continually find new ways to reduce waste and encourage recycling. Business cards are printed on 100% recycled stock. 82.3% of our 8.5 x 11 paper is 30% or higher postconsumer waste (PCW). We use papers certified by Forest Stewardship Council (FSC), Programme for the Endorsement of Forest Certification (PEFC), and other organizations. Our copier program supplies only 30% or higher PCW papers. Higher percentage PCW paper is available for copiers at an incremental cost. We encourage the use of 30%-100% recycled content papers. Imprints receives 85%-90% of orders electronically. Our goal is 100% paperless ordering. PrintConnection online portal allows paperless ordering from your home or office 24/7, eliminating unnecessary trips. Imprints employs electronic production tools for production, tracking, timekeeping and report generation. Read more about their commitment to sustainability here. At Payroll, we love to have employees go paperless in our office. Employees have been able to sign up for direct deposit via the At Your Service site for many years now. It is a self-serve portal which is managed by UC Office of the President (UCOP). You can do many HR and Payroll related activities on that site. Any changes employees make on AYSO are loaded directly to the local payroll system every night. Our payroll system also loads information, including earning statements for those with direct deposit and W2’s every year which employees can download and save digitally. This year we introduced a new pay card program to further assist employees in having direct deposit in place of a paper check. It is easy and convenient, especially for those who do not have a bank account. The pay card works the same way a debit card does and the funds are available immediately on pay day. There was a zero waste meeting with sustainability planning! We had composting, reusable mugs, reusable coffee carafes filled from the coffee cart, and signage. The disposable cups were ones we already had, but I had a really great response about the reusable mugs. And instead of getting more sugar packets, I asked not to have cups and sugar provided so we could use what we already had in the office. The only true trash we had was the napkin plastic wrap and the lemonade plastic juice plug! For our annual Student Symposium at the Forum, they asked for composting! SIO 4 Sustainability volunteers will be doing education on recycling vs trash vs composting when the food comes out. While HDH does offer discounts for using reusable bags and cups, at HDH sustainability we are focused on initiatives that are based more on the student population including the donation drive for the DAV that you mentioned, sixth-week swaps, waste audits, and sustainability education through RA programs and tabling events. The donation drive for the DAV occurs at the end of the year during move-outs, and we place bins in every college for students to donate to. The sixth-week swap occurs every quarter at participating colleges and is an incentive for students to swap clothes rather than throw them away, and all leftover clothes at the end also get donated to the DAV. Waste Audits occur at a different college every week, and the Econauts take a sample of 4-12 bags of trash from residential dumpsters and sort the components of the trash as trash and recycling. We then talk to students and RAs about a number of recyclables found in the trash and set goals to increase diversion per residential area. The sustainability education program focuses on educating residents about ways they can personally reduce waste; through activities which focus on differentiating between recyclables, compost, and trash, decreasing water waste, and living more sustainably we hope to that residents become more invested in reducing waste. UCen is currently trying to completely diminish the usage of plastic bags that many of the tenants at PC are still using. UCEN got Subway to switch to paper bags but the goal is still under works. Our composting program continues to be in motion. I believe that five tenants are participating regularly. UCEN is working on getting the report for this program published. Our restaurants also take part in the fryer grease collection program through New Leaf Bio-Fuel which is coordinated through University Centers. New Leaf is the campus wide provider of these services and works with HDH on Campus as well. One of our restaurants; Santorini Greek Island Grill, is Green Restaurant Certified. I attached the qualifications for that certification. We are working on getting all of the tenants to reach this certification by the end of 2020. The creation of a universal waste signage is also in motion. Can you imagine a world without waste? You don¹t have to imagine it ­ we¹re making it happen, and you can help. The University of California system is committed to going zero waste by 2020, and we¹re already diverting 69 percent of our solid waste from landfills systemwide. To get all the way to zero waste, we need everyone to pitch in: That means you. Ask yourself: Could my next piece of trash be #MyLastTrash? ZeroWaste Highlight: FM (Ellie’s ethereal gardens). IF you walk down the stairs of Cafe V’s patio, towards the green field, and turn right, you’ll see a pair of gray metal gates and a sign with a visible “E” peeping from behind. Walk through the gates and you find yourself in Ellie’s (Main) Garden, a rectangular plot of land lush with greenery. Keep going down the sidewalk and you’ll see more sets gates, which lead into Ellie’s Backyard, Ellie’s Farm, and (coming soon) Ellie’s Nursery. The secret behind Ellie’s green thumb? Compost. In the photo lies but one pile of “hot” compost, where raw material gets turned and watered so that, within a mere 6 weeks, it transforms into usable compost, which is then screened and added to the soil beds. Into this compost go kitchen scraps, paper, straw, plant trimmings, and (most of all) coffee grounds from Price Center’s Sunshine Market and Starbucks. During the summer, Chris Johnson, a groundskeeper with Facilities Management, rides in his electric golf cart and carries 9 buckets of grounds to the garden each week. Through the school year? 20 buckets a week. Whatever can’t fit into the bins gets sent to green waste and turned into mulch. Furthermore, the gardens are made from a lot of scrap material – reused railing, wood, benches that were left behind from other projects on campus. The only necessary purchases are gravel and potting soil, as many of the plants actually grow from seeds and roots taken from other plants on campus. In that way, Ellie’s gardens have diverted more than just green waste from landfills, and have helped make up for the loss of plants (on campus) which were torn down and destroyed by wind and rainstorms. ZeroWaste Highlight: Recreation recycles wrappers. WALK by the RIMAC and Main Gym weight rooms, Canyonview’s pool, Main Gym’s cycle room, or Rec Gym’s FitLife office, and sure enough you’ll find a box asking for your energy bar wrappers. UC San Diego Recreation is currently partnered with Terracycle to recycle these wrappers, conveniently placing bins where people are most likely to have wrappers to discard. All of the money collected, at 2 cents per wrapper, is then donated; Recreation has already given $350 to Feeding America San Diego, and another $188.40 to other charities, totaling a whopping $538.40 for 26,920 successfully recycled wrappers. CoreBio, a vendor which provides biotech products for UCSD’s labs, plans to stop packaging orders in plastic bags and start providing reusable ones. The inspiration: Prop 67. Prop 67, or the Plastic Bag Ban, mandates that grocery stores charge $0.10 per plastic bag, encouraging consumers to bring their own. The purpose is to reduce the number of plastic bags which end up in landfills and, more often than not, wildlife. CoreBio, inspired by California’s effort to be greener, decided to up the ante by getting rid of plastic bags entirely, and is currently looking into which reusable bags to order and hand out to customers, so that there’s at least one per lab; in the meantime, they’re packaging orders with biodegradable bags, which are compostable and can at the very least break down faster than plastic ones. Every week, the Econauts pick a different college to do a “waste audit” for. They take a sample of 4-12 bags of trash from the res-hall and apartment dumpsters, and sort out the contents between trash and recycling. Afterwards, they talk to students walking by about what they found in the trash. The most commonly found items that should have gone into recycling are: plastic dining hall to-go plates, plastic water bottles, cardboard boxes, and paper homework (of course). This year, the Econauts started working with RA’s to further reach out to college residents. RA’s in the Village, Marshall, and Sixth all defined goals to increase their colleges’ waste diversion from landfills. The Village set a goal to decrease the amount of recyclables found in trash marked for landfills by 12% in Winter Quarter. To do so, they put on a diversion competition between the Village East and West, and threw a final food party for the winning side. They also got new signage out to residents, and applied for a green grant to get bigger recycling bins for the apartments. 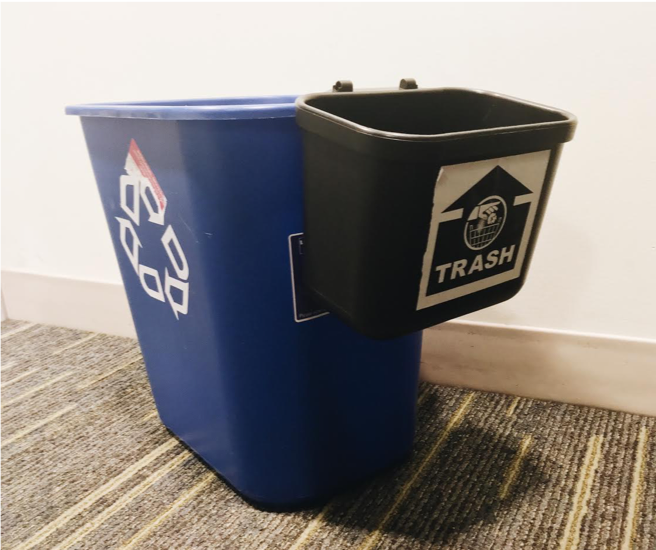 Meanwhile, Marshall College res-life set a goal to decrease the amount of recyclables found in their trash from 50% to 37% for Winter Quarter, and then to 27% by the end of Spring Quarter. They aspire to put together a competition between res-halls for decreasing water and trash waste, promote more programs focused on proper waste sorting, and share a video showing the life of a recyclable (made by the Econauts). Over on the other side of campus, Sixth College res-life set the goal to decrease the amount of recyclables found in trash from 33% to 25% by the end of the school year. They plan to increase programming geared towards correct trash disposal, and put up extra signage to increase student awareness on what’s recyclable. Learn more about UC San Diego Green Labs here. Learn more about UC San Diego Green Office here. The goal for the zero waste event was to create excitement on campus about zero waste, that it is a goal for the campus to not send any trash to the landfill by the year 2020, and to collect data through the post-game trash audit to help identify a current baseline to create goals and strategies to get us to zero waste by 2020. Volunteers served as Green Goalies to help attendees with proper waste disposal and also participated in a waste audit. The Sustainability Resource Center is open during the academic quarters from 9AM-4:30PM. The University of California has committed to sending zero waste to landfill by 2020. Zero waste protects our environment, reduces greenhouse gases, promotes clean innovation and creates green jobs right here in California. It’s not only an important goal, it’s doable. UC is already diverting 69 percent of our solid waste from landfills systemwide. We’re sending 26 percent less waste per person to landfills than other comparable universities. We are running in the right direction, but the last mile is the hardest. To get all the way to zero waste, we need everyone to pitch in by not pitching out. Ask yourself: Could my next piece of trash be my last trash? Refuse what you don’t need, reuse what you can, and recycle what you can’t. My campus. My community. My planet. #MyLastTrash. Visit UC Zero Waste for more information.